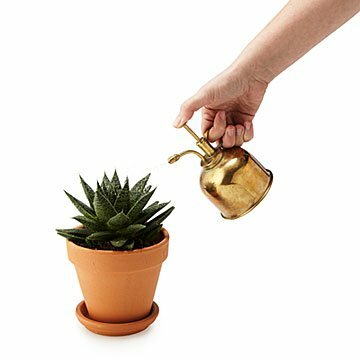 Upgrade from plastic watering cans to this elegant brass mister, which expertly waters succulents. When it comes to feeding your favorite rosettes and seedlings, a plastic watering can or pour from your drinking glass won't do. Upgrade to this elegant brass mister, which waters plants evenly and complements their striking beauty. Over time, the design acquires a unique patina, giving it a bit of rustic charm and one-of-a-kind elegance. The blend of stunning home decor and functionality makes a great gift for green thumbs and succulent enthusiasts. Made in China. Not sure which succulent is best for you and your brand new mister? Check out ten of our top picks for indoor gardeners on our blog, complete with infographic. 6" H x 3.5" Dia. Designed to naturally develop an antique patina over time. Its rare to find a product that feels solid in the hand. I bought two and have been using them for a few weeks. Happy indoor gardener here. Bought this item three times!! Love it! Would use this as a water mister for succulent plants. My mother, mother-in-law, and sister-in-law love plants and they totally loved this item as a gift from me. Exactly as advertised, good value! This was for my husband with a great, green thumb. He cares for our air plants and orchids and this was the perfect gift specifically for our air plants. I was happy to find this and love keeping it on the counter instead of a great big plastic spray bottle. My daughter was delighted with the plant mister. I was delighted to find a gift that was both useful and unique. This makes watering the plants so fun! I bought some baby succulent plants and was reading that you have to be careful how you water them and also how often you water them. I saw this item and thought it would be perfect for my new plants. Originally, I was going to buy it for my brother and buy some plants to go with it, but decided to keep it for myself. This is a durable product. I ended up getting him something else from Uncommon Goods instead. This was a well received gift. Since it was a gift, i'm not sure how well it works, but the recipient loved it. purchased as a gift for my boyfriend who is finnally keeping a plant alive. it will be the 6month adoption of his money tree and a celebration that he is capable of taking care of a living thing. albiet a small living thing in the grand skeem of life ,but i am impressed none the less.He took am old spray bottle from his sister and actually takes the plant into the bathroom when he showers, no joke!! i cant wait to see how happy he is with the fancy copper spritzer for a job well done.